With the cost of professional acrylic paint as high as $448 per gallon*, any product that allows you to squeeze extra paint from each tube is worth buying. I purchased a plastic tube wringer a few years ago and I have found that it definitely increases the amount of paint that can be squeezed out of each tube. The manufacturer claims that it's as much as a third more volume from each tube. I'm not sure if it's that much, but if you use it on every tube of paint it will pay for itself in a short amount of time. It also works on other tube products such as toothpaste, frosting, and caulk. I recommend buying a separate wringer for food items. I bought the cheap plastic wringer and it has been used regularly for the past few years without breaking. Sometimes the plastic gears don't seem to grip the tube very well but I just pull the tube through while turning the knob. This only happens with the thicker plastic tubes such as the "Liquitex Basics" acrylics. 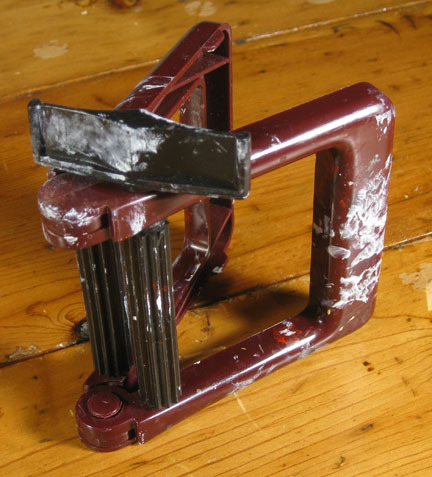 The metal wringer may not have this problem, I haven't tried it yet. The average cost of a 2oz tube of acrylic paint is roughly $7. A gallon consists of 128oz so it would take 64 tubes of paint to make a gallon. 64 x 7=$448.